Yes. YES! We are totally doing this again. This is the fourth year that I am thrilled to host the First Book Of The Year. As always, I hope you will join in this fun event. I absolutely LOVE seeing the pictures from all over the world of all of you with your first books. So what is First Book of the year? The First Book is a book that maybe you have been wanting to read for a while but have not had time for, a coveted book, an old favorite re-read – whatever you want. The point is that this is the book that will kick off the year for you. What will it be? 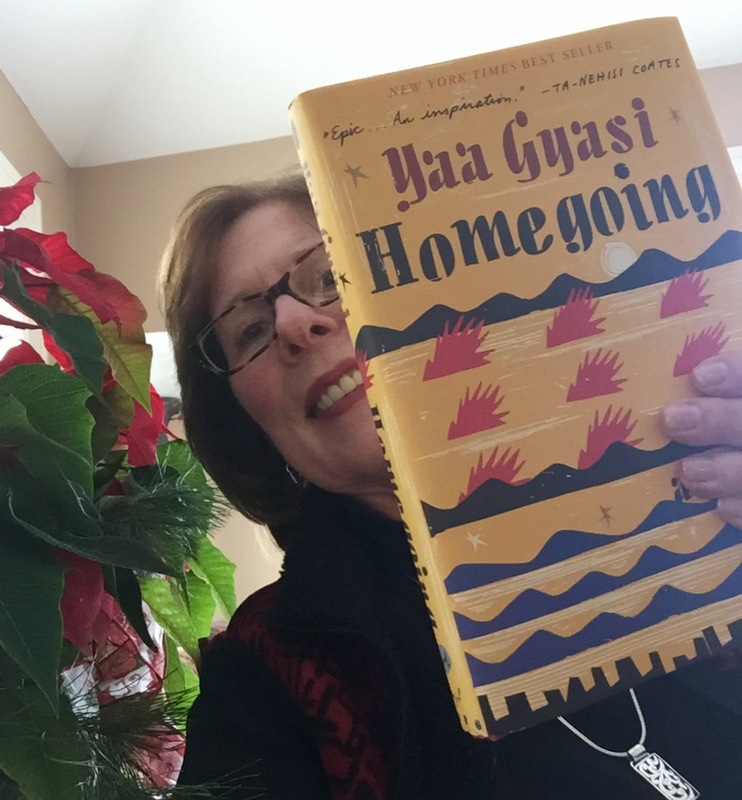 This year I selected Homegoing by Yaa Gyasi... the book I most regret not reading in 2016. I borrowed it from the library, read the first chapter and thought it was wonderful, but the loan expired and the ebook disappeared from my kindle. As rave reviews continued to multiply, I decided to purchase my own copy and start the new year off right! Have you chosen your First Book of the Year? Audrey - The audio version of Homegoing has very high rating, too, but I'm actually going to read it ;-) Enjoy the Queen Victoria bio! Hello and happy new year! I think I may join in and get my husband to get my photo with my new book too. Nice choice for you and your photo is great. I'm looking forward to a new year of reading and going outside my usual picks, exploring a bit in the literary world. Tina - Happy New Year to you, too! I hope you can get your hubby to take a picture with you and your book... it's a fun way to start the year. Happy reading in 2017! Sarah - So glad to finally read Homegoing. Happy New Year! Happy new year, JoAnn! I've heard lots of praise for your first book of 2017 and hope it is the start of a great reading year. Catherine - I have high hopes for this book. Happy New Year and happy reading! Enjoy your first read of the year - great picture. ENJOY...I like the story of your book. Elizabeth - Seeing the faces behind the blog is so much fun. Happy New Year to you, too! I have to look up your book, you've got me all curious now. Hope you love it and that you have a wonderful reading year in 2017! Laura - Homegoing has so many rave reviews on goodreads. Hope it starts the year off on a high note. Happy reading in 2017 to you, too! I bet that's a good one! Happy New Year! Kathy - The first couple of chapters are so good!! Picking a 2016 regret is a great first book! Happy New Year! Happy New Year! I've heard the raves on this one so I'm looking forward to seeing what you think of this one. I had that happen with the book I had thought was going to be my last book of the year. The actual reading of it didn't happen so I'm calling do over in a few weeks! Happy reading! Katherine - If I'd thought to put my kindle on airplane mode, it wouldn't have disappeared on me! Great pick...and photo! I have been hearing great things about this one, so enjoy! I love how you were able to find it again, after a "false start" with the library book. Thanks for sharing...and for visiting my First Book. You look lovely in your photo! And good choice too. I might read more "popular genre" than you, but I do enjoy a good nonfiction/literary fiction such as you read sometimes and this one was on my radar. Thank you, Rita. I'm finding that popular genre works for me more and more lately... don't think I would have made it through December without it! I've been thinking about reading this. It does have really good reviews! Vicki - The reviews are great. Hope my experience is similar. Jill - Fingers crossed... the beginning is very good! Nice pic! You're starting off 2017 right for sure. I need to get to this one as well. Terrific photo! Enjoy your new book and Happy New Year JoAnn! Pat - The first three chapters are very good. Can't wait to sit down and read later this afternoon. What a cute picture! I bought this book at B&N with a great coupon but ended up starting a different book. Happy New Year! Iliana - I used a B&N coupon for this one, too! Happy New Year. I hope this book starts a great reading off for you. Nise' - So far it's very good! I really want to read Homegoing. I hope you are enjoying it! Happy New Year! Wendy - I am... it's very good so far. I just bought that, too - cannot wait to read it! Lisa - Hope we both love it! Homegoing looks like such an interesting book. I look forward to knowing what you think of it. I have just continued the three books that I was reading into the new year. I guess whichever one I finish first will be my first book of the year. Brian Joseph - The first three chapters are wonderful. It looks like this may be more a collection of stories, each about a family member as generations pass. Beth F - Thank you and Happy New Year to you, too! Hope you enjoy your First Book Joann; I enjoyed that one in 2017. Diane - I remember reading your review. Happy New Year! My first is a book I gifted myself .... "Peacock and Vine" by A. S. Byatt, a wonderful essay in small book form (183 pages) about William H. Morris and Mariano Fortuny. For anyone interested in late 19th Century artists/craftsmen, textiles, etc., it is Byatt's very enlightening introduction to two great artists, and beautifully illustrated. Also, a great gift item. I also have another book going, another non-fiction, that you will hear more about later. JudyMac - Sounds like a wonderful gift... perfect for you! ;-) I look forward to hearing about your latest nonfiction read. Happy New Year. My first book of 2017 is Death Comes to Pemberley by PD James. I just moved to England last week for two years and this happens to be the book the other American wives a!ready here selected. Keep hoping that I will happen to see Coli Firth out and about here I Cumbria. Heeheehee...I just put a hold on it so I am not sure if you are a good or bad influence on me! Happy 2017! Patty - I've read about 100 pages and it really is wonderful. Each chapter focuses on another character, sometimes a generation later... not sure if we'll see the women from the earliest chapters again. Bellezza - All the praise for Homegoing seems to be warranted. I'm halfway through and loving it!